Beauty often comes in a simple form. Like a crisp blue sky that gently fades lighter at the horizon. 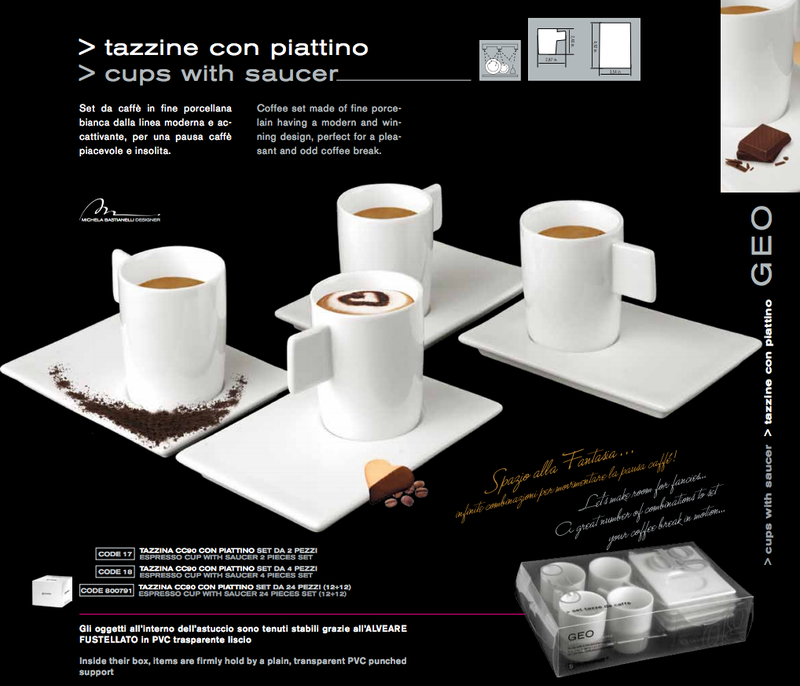 That’s the kind of beauty these porcelain cups from DeaGourmet evoke. DeaGourmet is an Italian design company that specializes in foodware design. The firm insists on starting with high quality materials, and manufactures its products with a blend of ancient porcelain creation. These cups are perfect for lungos, as they come in at 2.4″ tall — plenty of room to fit under a Nespresso machine spout. At just under 3″ wide, we figure this will hold roughly 6 to 9 ounces. [We’re in touch with DeaGourmet now to try to get a handle on the exact capacity of each of their cafe cups!] The saucers are perfect for cafe cookies or chocolate treats. Watch a video where these, and other DeaGourmet cups are discussed. See DeaGourmet’s brochure page about this product. Here’s another Bodum Porcelain tumbler, but this one is 6 ounces, whereas the previous post was for an 8-ounce cup. I think some of you might prefer this slightly smaller cup at 6.8 ounces, which is likely to be closer to the size of your Nespresso lungos. Nespresso’s factory settings for lungos are 3.75 ounces, but I tend to make mine about 6 ounces, and sometimes more, or I may even add an extra shot of espresso on those sleepy mornings! Like the previous post of the 8-oz Bodum Porcelain tumbler, this one has a silicone grip that comes in a variety of colors, including brown, pink, yellow, and blue. Prices range from about $25.00 to $35.00 for a set of two, depending on the color and the seller. This cup is 4 inches high — it won’t fit under the Essenze spout unless you hold it. A favorite for lungo fans, this Bodum 5-ounce cup is a great cup for your Nespresso lungo, or a double-shot of espresso. We love Bodum cups because they make the coffee look as good as it tastes! The double-walled glass is meticulously engineered to keep the outside wall comfortable to hold, while the insulation and inside cup keeps your coffee hot. If you like your lungos with a little more water, then you may need a cup with a larger capacity. Use the Categories to the right, or the “Capacity” navigation at the top of this page, to find the size that’s right for you. Nespresso machines are factory set at 3.75 ounces, so for most of you, this 5-ounce capacity should be plenty. The size is just right to fit in your Nespresso machines, even the Essenzas and Citiz. Bodum says these are dishwasher safe, but be careful. Lots of reviewers who’ve purchased Bodum double-walled cups find they are sensitive. If you have any experience with Bodum cups for your lungos, please post here. We’d all love to hear from you! Set of 2 Available from Amazon.com. OK, we know this is crazy. After all, you’re brand is Nespresso, so why drink Nespresso from a Lavazza cup? Well, if you like coffee, then you probably know and appreciate the Italian brand coffee, Lavazza. And maybe you’re like us, and you like to travel, too. If that’s the case, then this coffee mug can bring back some nice travel memories as you sip your favorite Nespresso lungo! Another thing about this mug is the size: it’s 5.5 ounces. That’s just about as small as a mug can get to fit Nespresso’s factory lungo setting of 3.75 ounces. So, if you’ve altered your settings, or if you like your lungos with a little more water, then this mug will be too small. This is for those of you who really like a small/short, rich coffee. Comes in a set of 6 cups and saucers.